I love living in a small apartment for many reasons. One is there is less to clean. A big downside though is lack of storage. I've recently been working on my closets and shared some small space closet solutions here. That is an ongoing project. Kitchen solutions now have me sidetracked. I am lucky to have quite a bit of cupboard space, but I still am having a problem getting it all organized. 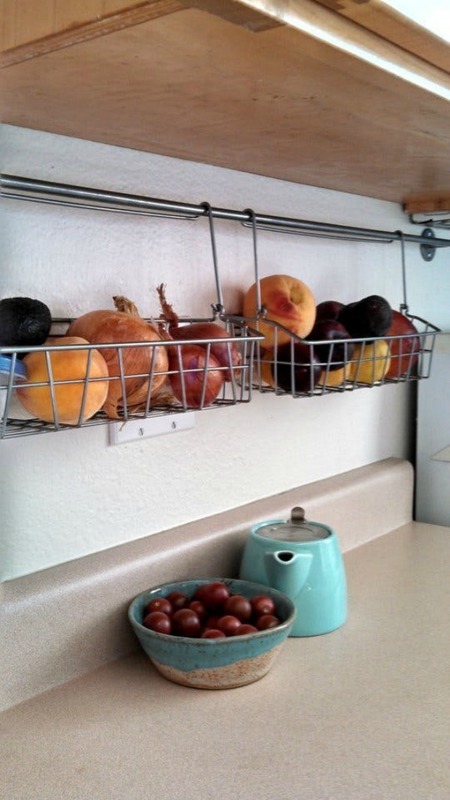 I saw this lid storage idea several places on Pinterest, but when I looked it up on Amazon it only had one review and that review wasn't favorable. Too bad, I was really liking it. I'll be on the lookout for something better, because I can never seem to find the lid I want. It would be wonderful to have room for this. 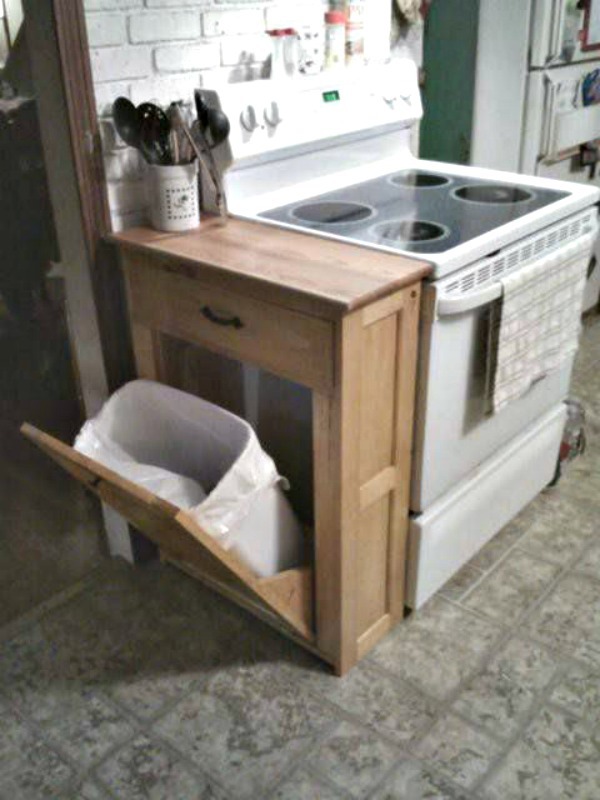 My trash can takes up so much space under my sink. 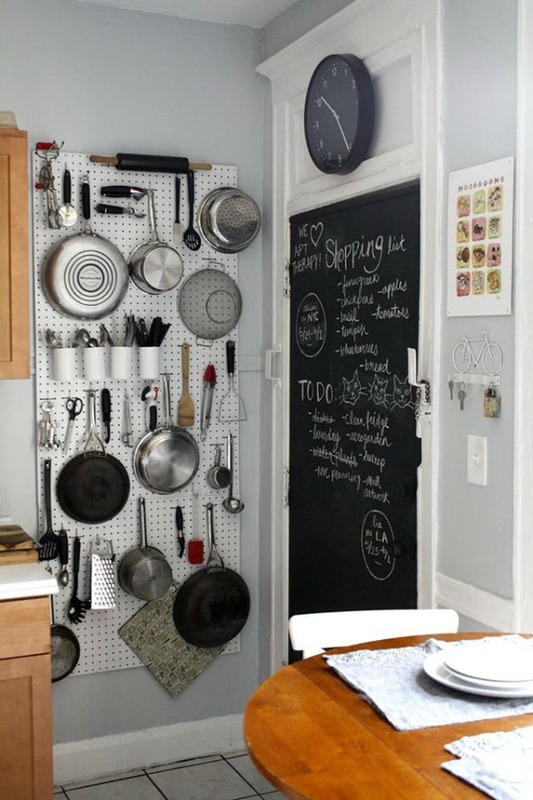 Why oh why do I not have room in my kitchen for something like this? Why oh why do I not have a lot more money? 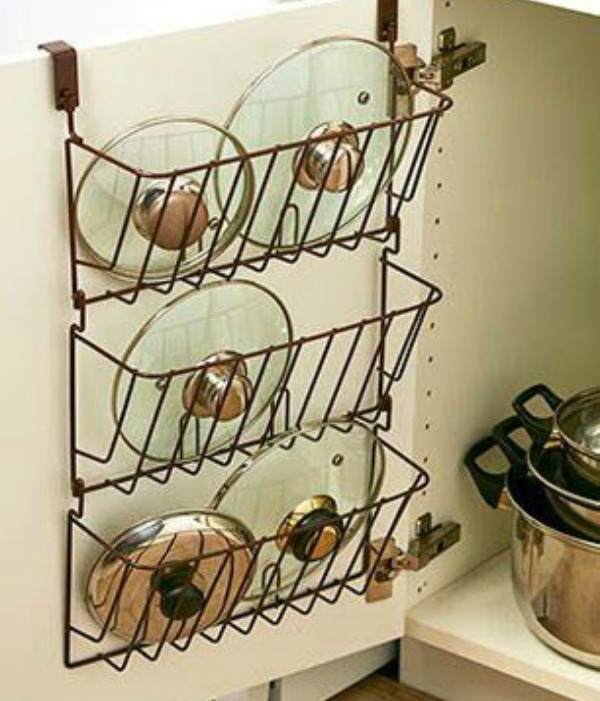 Why oh why did Pinterest have this under apartment kitchen organization ideas? 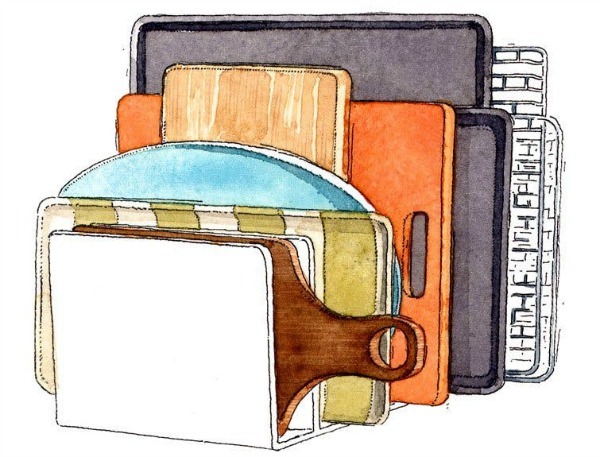 This is an apartment kitchen idea that I can really get behind. I would give my eyeteeth for wall space for this. Maybe in my next apartment. Now this is a space that I definitely utilize in my apartment. I do like the wire baskets that this apartment dweller has used. 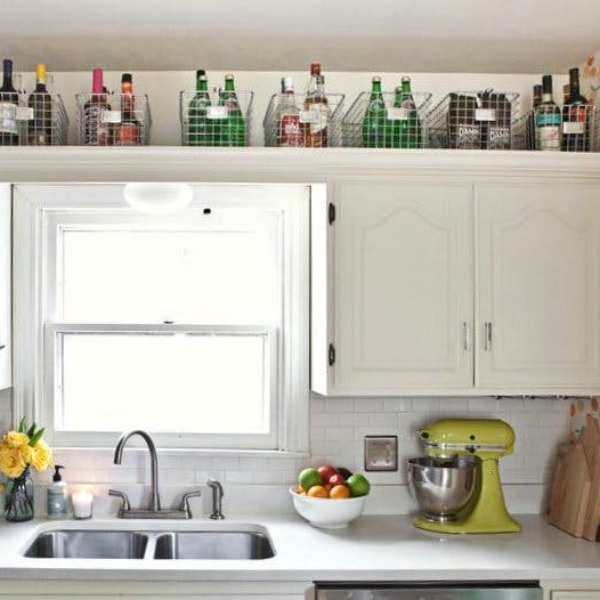 I am using woven baskets above my cabinets. Wow, what is that old saying about if you hold onto something long enough you might need it? I have several of these old metal file holders around and I've been thinking about selling them. I never thought about using them in a kitchen. Hmmmm!! Okay, one more. This is one I am seriously contemplating too. Not sure if I have room. Too much on my counters, but I may make space. I am now going to go into my kitchen and contemplate for awhile. Have a great weekend. It's March Madness. P.S. Check out more posts about small spaces here. i have bought some inexpensive organizers for inside the cabinets that really help to maximize space. something like the file folder. it was a game changer. happy weekend! Oh that's too bad that those shelves got a bad review. This post had some great ideas. Thanks for sharing! I too live in a small space and the kitchen is a challenge for sure. Some good ideas here! 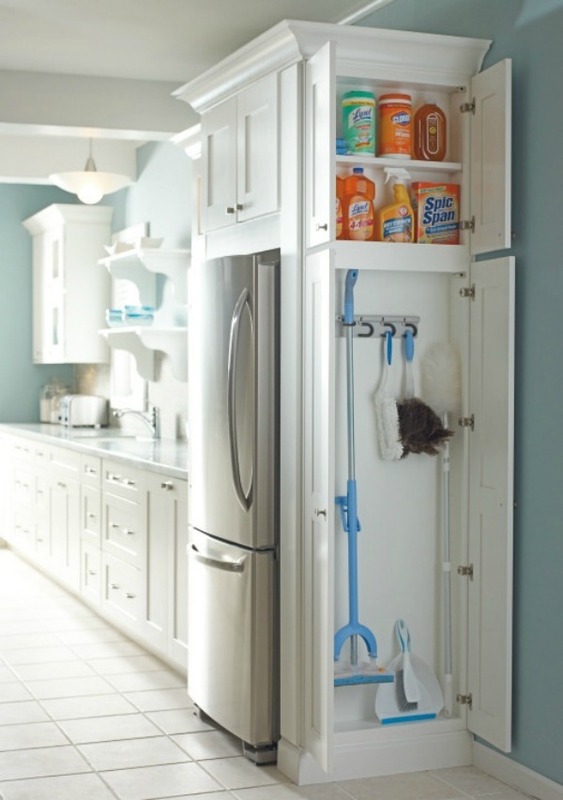 Oh why don't I have more space in my kitchen to make a small closet for the cleaning items, brooms, etc. I think if I try hard enough I have a little space on my utility room...umm, I'll check. Thanks for the awesome ideas for organizing, love them all!